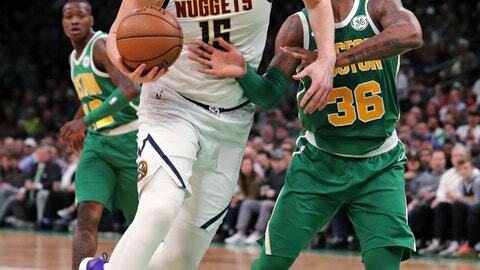 BOSTON (AP) — Nikola Jokic had 21 points and 13 rebounds and the Denver Nuggets rallied in the fourth quarter to beat the Boston Celtics 114-105 on Monday night. DALLAS (AP) — Dirk Nowitzki passed Wilt Chamberlain for sixth place on the NBA’s career scoring list, but Elfrid Payton had his fifth straight triple-double to help New Orleans beat Dallas. Julius Randle scored 11 of his 30 points in the final 3:29 of regulation, helping the Pelicans rally to force overtime. Entering the game needing four points to pass Chamberlain, Nowitzki started for the ninth time this season. He made his first two shots to end the suspense with a sellout crowd on its feet. SAN ANTONIO (AP) — DeMar DeRozan had 26 points and nine rebounds, LaMarcus Aldridge added 23 points and 13 rebounds and San Antonio beat Golden State for its ninth straight win. San Antonio won its 11th straight at home and moved into fifth in the Western Conference at 42-29 following Oklahoma City’s loss to Miami. There were nine ties in the intense matchup between the West’s best and the league’s hottest team. PORTLAND, Ore. (AP) — Damian Lillard had 30 points and 15 assists as Portland beat Indiana without starting guard CJ McCollum. Jusuf Nurkic added 18 points and 11 rebounds for the Trail Blazers, who led by as many as 21. Portland has won four of five and is holding onto fourth place in the Western Conference. Myles Turner had 28 points and 10 rebounds for the Pacers, who missed out on clinching a playoff spot in the East. Indiana (44-27) has lost six straight on the road. The Blazers (43-27) won their 10th in a row against the Pacers in Portland. Portland was playing its first game minus McCollum, who injured his left knee in Saturday’s loss at San Antonio. McCollum, who is averaging 21.3 points per game, has a popliteus strain and will be re-examined in a week, the team said. It isn’t known whether he’ll be back before the end of the regular season. WASHINGTON (AP) — Rudy Gobert had 14 points and 14 rebounds, Donovan Mitchell scored 19 and Utah won its fourth straight by beating Washington. Gobert, the reigning Western Conference Player of the Week, was perfect from the field (6 of 6) for Utah, which started the night seventh in the West, one-half game behind San Antonio. OKLAHOMA CITY (AP) — Goran Dragic had 26 points and 11 assists, Dwyane Wade added 25 points and Miami took advantage of Russell Westbrook’s absence to beat Oklahoma City. Kelly Olynyk added 18 points and nine rebounds for Miami, which entered the game in eighth place in the Eastern Conference. The Heat snapped a six-game losing streak against Oklahoma City, which has lost nine of its past 13 games to fall to sixth in the Western Conference. TORONTO (AP) — Jeremy Lin scored 20 points, Fred VanVleet had 13 points and 12 assists, and Toronto beat New York. CLEVELAND (AP) — Collin Sexton scored 27 points, including the go-ahead 3-pointer with just under two minutes to play, and Cleveland defeated Detroit. PHOENIX (AP) — Robin Lopez scored 24 points to help Chicago beat Phoenix and snap a five-game losing streak.